Need Help With Grumbling and Misbehaving? Companies regularly contact me to write reviews and give away their products. I, in turn, regularly turn down anything I don't feel will benefit our homeschool. It's that simple. I will never review or give away anything we have not used and enjoyed in our home. 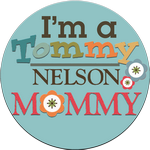 I am so proud to be a Tommy Nelson Mommy! The products I receive from Tommy Nelson are always of the highest quality and I recommend them without reservation to you. It's a huge world of resources for children out there, and I hope to provide you with reviews of some of the best! Over the past several years my children have always enjoyed the "Hermie" movies and books by Max Lucado. Our church had quite a generous stash of them in the library, which I think my children had checked out most of the time! 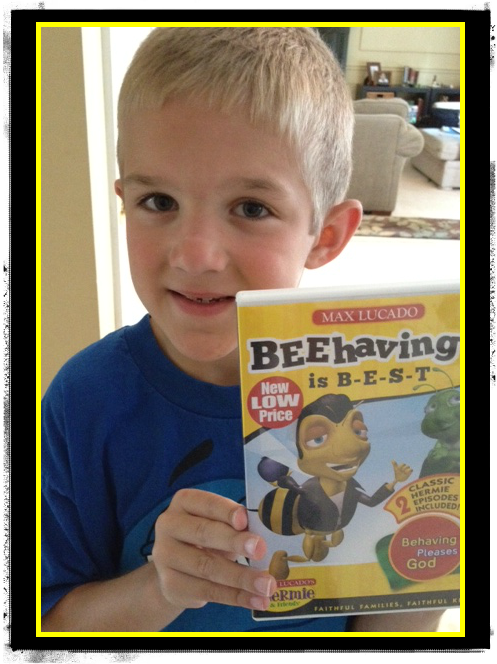 The latest Hermie DVD, "BEEhaving is B-E-S-T" : Behaving Pleases God! is a new favorite in our home. It consists of two episodes: Buzby the Misbehaving Bee and Buzby and the Grumblebees. If you're look for QUALITY character education material for your young children (target age is 4-7), our family highly recommends this DVD. When ours arrived in the mail, GMan immediately snagged it and layed on the sofa -- watching and giggling for the next hour. In Buzby, the Misbehaving Bee, the garden is all abuzz thanks to its newest resident: Buzby, the self-proclaimed “king of bees,” who refuses to follow any of the Garden Golden Rules. Soon Buzby has managed to bug every citizen of the garden—and Hermie and his pals don’t know what to do. But through an unexpected act of kindness (not to mention some intervention from the real King of the garden), Buzby finally learns that nobody is too cool for the rules—and that rules are actually pretty helpful! When I asked GMan what he thought of the DVD he said, "Well, anything with Don Knotts is funny!". The cast of voices is quite impressive: Tim Conway, Don Knotts, Vickie Lawrence, and Melissa Disney. The humor and nuggets of Biblical truth keep kids interested and engaged. How do you reward your kids for following the rules and doing the right things? This giveaway will be open until Saturday, June 30th at midnight. Disclaimer:I received the above named product from Tommy Nelson in return for my honest review. I have not been compensated in any other form.